After falling sharply over the past two years, oil prices have been rising once again since the start of the year. While a barrel came in at around 110 dollars in early 2014 and 31 dollars in early 2016, it is now close to 50 dollars. 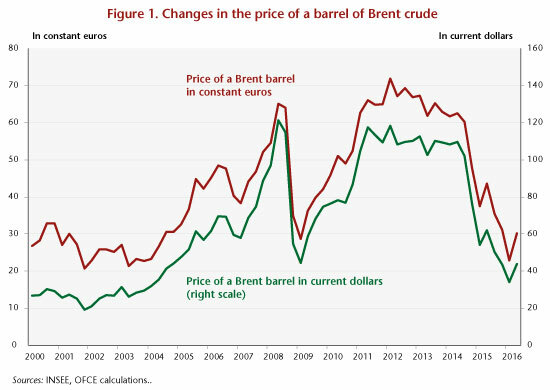 Will this rise in oil prices put a question mark over the gradual recovery that seems to have begun in France in 2016? 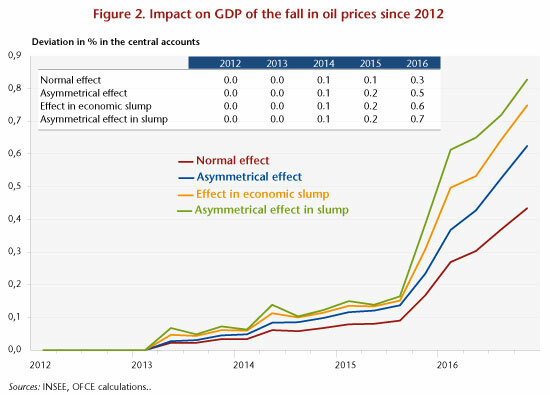 Finally, the impact of oil price changes on economic activity depends on the phase in the business cycle: the elasticity does not differ significantly from zero in situations of a “crisis” or a “boom”. However, the elasticity is much greater in absolute terms when the economy is growing slowly (an economic slump). Let us now apply these results to the situation since 2012. Between the first quarter of 2012 and first quarter of 2016, the price of a barrel of Brent crude plummeted from 118 dollars to 34 dollars, a fall of 84 dollars in four years. If we factor in the euro/dollar exchange rate and changes in consumer prices in France, the fall amounts to a 49 euro reduction over the period (Figure 1). We evaluated the impact of a decline like this on France’s quarterly GDP, taking into account the above-mentioned time lag, asymmetry and phase of the business cycle. Factoring all this in indicates that the oil counter shock ultimately did not show up much in 2015. As illustrated in Figure 2, the impact should make itself felt from the first quarter of 2016, regardless of the hypotheses adopted. The positive effect of the oil counter-shock is yet to come!